a dollar amount for each item BUT is willing to consider "offers." Stamped reverse: "The George Washington Masonic Memorial Plate" 0n banner + Old English Staffordshire Ware + Jonroth England + Adams + Made in Staffordshire England Exclusively for Alexandra Washington Lodge #22. AF&AM. The George Washington Masonic National Memorial Alexandria, VA. Wood & Son Ltd. Potters for 200 year. Plate—0002. Old English Staffordshire Ware General Lee's Headquarters Gettysburg, Pa. Plate Description: blue and white floral border around plate. Center = image of "General Lee's Headquarters Gettysburg, PA."
Stamped: Adams Estd 1657 England + Jonroth England. + Imported for E.F. Larson Lee Museum Gettysburg, Pa. Plate Description: blue and white plate. Center = image of "Anne Hathaway's Cottage." Plate reverse: minor razing on reverse. Description obverse: in the center = "Statue of Liberty" + "Empire State Building" + "Rockfeller Center." Around the plate edge = various scenes" "Lincoln Center" + "John F. Kennedy. International Airport" & "La Guardia Airport" + "Times Square" + "United Nations." These scenes = interspersed with flower & leaves decorations. Description reverse: "Fabulous New York City of Wonders" on banner + "Fort viewed by Verrazano in 1524. Discovered by Dutch Henry Hudson in 1609. Settled in 1613, Manhattan Island purchased from Indians for $24.00 by Peter Minuit in 1626. Peacefully occupied by British in 1664. Recovered by G. Washington in 1764 during Revolutionary. Greater New York founded Jan 1st 1898 which includes the counties of New York (Manhattan), Bronx, Kings (Brooklyn) Queens, Richmond (Staten Island). Maker: Fine Staffordshire Ware. by Enco National, New York N.Y. Made in England. Underglaze — Detergent Proof. Diameter: 8 inches.Stamped: Made in Japan + this "Warning: For decorative purpose only. Not to be used for serving Foods." Majestic Peacock (with magnificent tail) seated on tree branch in a garden filled with multi-colored flowers and leaves. This Edward M. Knowles company china plate features a vibrantly colored peacock — with 5 tufts on head, a long partially opened tail, multi-colored wings — strutting across the plate from left to right. Trees in the background create a sense of depth and perspective. Vintage crazing on front and reverse of plate. More information about this plate and company. The "Peacock" appears to have been a favorite design of the Edwin M. Knowles Company: e.g. two plates features the Aesop Story of "The Jay and Peacock" (BX6 and NB6) and also a dinner plate design known as "Peacock and Floral Center (KTK6) — all featured at Replacements under the Edwin M. Knowles Co. listing. For information about the company, see: "Your Guide to Buying Knowles Collector Plates." from which the following is excreted — Knowles collector plates are divided into two distinct historical periods which are marked by their different manufacturers and associated themes. 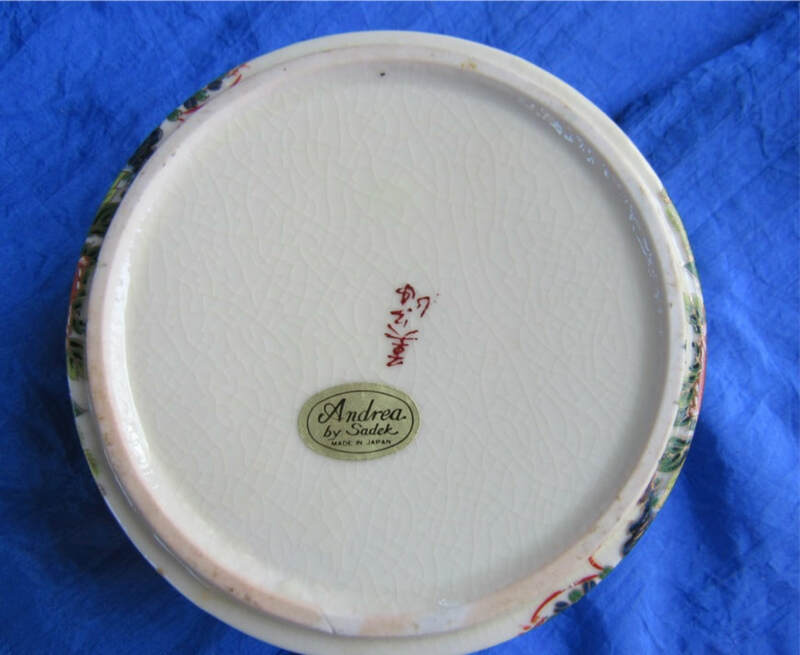 The original Edwin M. Knowles China Co., which established the name, no longer exists. Yet, its pieces still float around on the market and generally carry a much higher price point. The modern version of the Edwin M. Knowles China Company, by contrast, still produces new items each year. The name Knowles in the collector plate field refers specifically to a man named Edwin M. Knowles. The son of pottery producer Isaac Watt Knowles, Edwin began producing what he called the finest quality semi - vitreous chinaware after graduating from Harvard University in 1890. Officially entering the market in 1901, Knowles' pieces rapidly grew in popularity throughout the end of the nineteenth and beginning of the twentieth centuries which increased both demand and production of Knowles' product through the Depression Era and beyond. This peacock plate is from this period of Knowles production. Plate—0009. Vintage Antique Pink G. Phillips Ceylonese Plate (1832-1834) Transfer Ware. This plate (which may have been influenced by Seaports of India & Ceylon by Geo. Phillips) is found with a blue and white — but RARELY in pink. The date assigned to this plate is 1832-1834. The design features a peacock seated on the rim of a large classical urn and several Chinese pagodas in the distance. The upper rim is decorated with delicate flowers and foliage. The Phillips pottery was founded by 22 and 20 year old brothers, Edward and George Phillips, in 1822. One of the brothers, Edward, was married to Benedicta Wedgwood, who had become the ward of Josiah Wedgwood after the death of her father, Thomas, of the Overhouse Works. The brothers leased the New Bridge pottery in Longport which had been vacant since 1817. It was superbly located on the Trent and Mersey Canal. The older brother, Edward, was enthusiastic about the possibilities of exporting their wares to America as other potters nearby were already involved with trade to America. In September 1831, he along with his wife and children were on their way to America when tragedy struck and Edward was killed in a carriage accident. His widow sold her interest in the pottery to George in 1834 and the marks were changed to G. PHILLIPS. George continued many of the patterns, and while maintaining the quality of earlier wares, he also introduced two new patterns, Verona and Park Scenery, which were both enormously popular. Park Scenery was produced in red, green, blue and brown. Sadly, George also met with an untimely death, at the age of 45. The following year, his factory and home were auctioned and his wife left Staffordshire with their children to start a new life in Australia. A partial dinner service in blue is in the collection of Olde York Historical Society in York, Maine. The Hollis NH Historical Society owns a platter, and shards have been excavated in Deerfield, MA. Many of the buildings on the New Bridge site survived well into the 20th century, and the master potter’s house, occupied by George Phillips and his family until 1841, is now the Duke of Bridgewater Inn. The bottle ovens and factory buildings were demolished in the mid twentieth century. The above information is from the website: "Nancy's Daily Dish"
This plate has 6 sides. 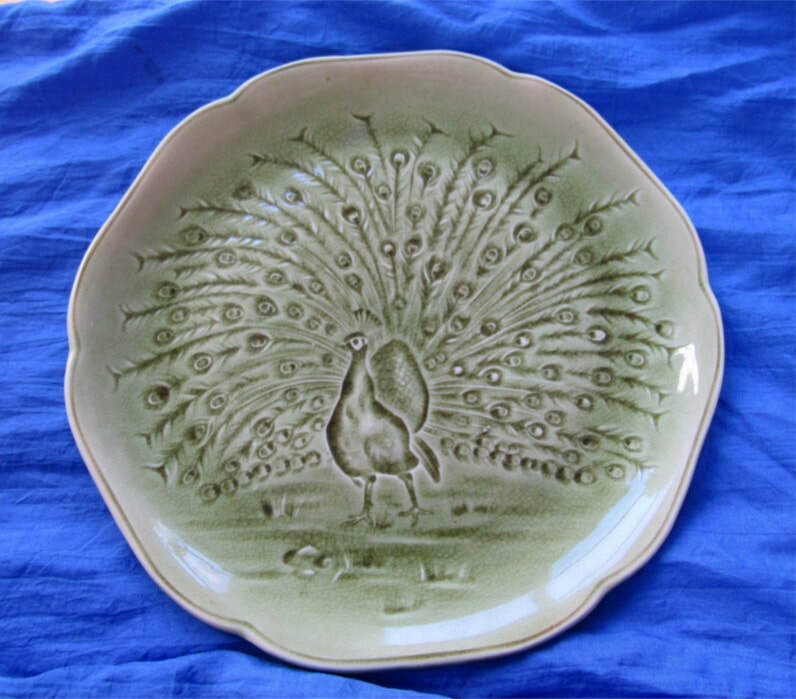 In the center (right side) of this plate is a magnificent male peacock displaying his large open tail, complete with many eyes. In the center of this plate (left side) is the female peacock virtually hidden within the floral foliage. The artist has captured with animation the "intense stare" between the two peacocks (note the eyes looking at one another!). Mark: in Chinese + "Japan." Mark: Cauldon China. England. Est. 1774. Plate — 0013. Elbow Beach Surf Club. Bermuda. Decorative view of the hotel. Plate = decorated with vintage gold plate. Plate — 0014. Souvenir of Salem Mass. Blue & White plate. Nathaniel Hawthorne. Marked: Jonroth, England. Imported for Daniel Low & Co. Sale, Mass. Description: multi-colored peacock (green, yellow, blue, red) standing on a branch with red and pink flowers and green leaves. Plate — 0017. Wedgwood Old Blue Historical plate scene of Newburg, N.Y.
“Washington’s Headquarters. Newburg, N.Y.” Blue/white china plate with “Washington’s Headquarters, Newburgh, N.Y.” in the center of the plate, surrounded by decorative roses and leaves. Marked: “Washington’s Headquarters 1780 — Newburgh, N.Y. — 1899. Occupied by Him from Apr 4 1782 to Aug. 18, 1783.” + “Wedgwood. Etruria. England” + “SCIE Importers. Jones, McDuffee & Stratton, Boston. with multiple colored flowers, trimmed with gold leaf decorative designs. "The Jay and the Peacock" the sixth in the series of Aesop's Fables plates issue in 1988 and 1989. Includes: certificate, booklet about Aesop's fables & the story of the Jay and the Peacock, and original box. Plate= mint condition. Maker: Edwin M. Knowles North America's oldest Name in Fine China. This is the "sixth issue in the Aesop's Fables collection depicting ancient tales of human follies and virtues believed to have originated with Aesop in 600 B.C. Michael Hampshire's original work was painted solely for this edition, which is a maximum of 150 firing days. "— this text = from reverse of the plate (see picture). Plate — 0020. Antique French Majolica Peacock Plate made by Hautin Boulanger at the Choisy le Roi majolica factory established in 1786. This plate, green in color, was made between 1863 and 1910 (probably close to 1863 than 1910). Size: 8.75 inches in diameter. Condition: no chips, or cracks. Some crazing appropriate to plate's age. Faience pottery was first produced in Choisy-le-Roi in 1804. By 1836, the factory came under the management of Louis Boulenger who was succeeded in 1863 by his son Hippolyte Boulenger. By that time, the factory employed some three hundred skilled workers operating four kilns. A large number of majolica designs were added to production in the early 1860s and continued until 1910. — Source: Majolica International Society (search the internet with these source words). plate- — 0021. Vintage Inlaid Wood Marquetry. Multi colored wall plaque with inlaid image of two peacocks standing on rock boulders + trees behind the peacocks and 2 birds flying above. Size 18 inches x 10 inches. Description: two peacocks (male and female) standing on branch surrounded by multiple colored flowers. Flower branch on bottom of the dish. Maker: Countless. Fine Bone China. Made in England. Maker: Royal Doulton. + Made in England. Royal Doulton Bone China.” + H5157 + JRDJAR SUMMER COLLECTOR © 1989 Royal Doulton. 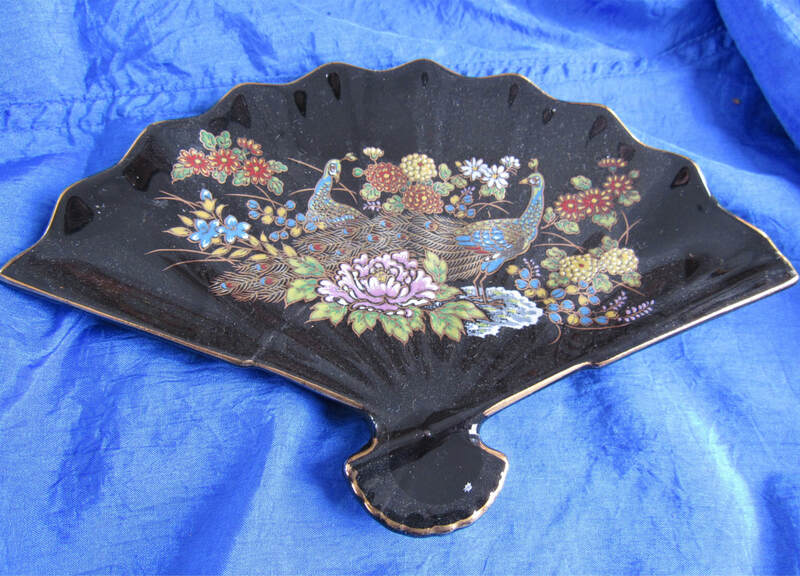 This wonderful Peacock calling card tray features a strutting peacock with fully open tail serving as the place to deposit the card. Maker: unknown. Stamped J.B. 2528 (on reverse side). Three-dimensional peacock with full open tail (note the eyes) to form the bowl of the ashtray. Probably made in India peacock. Diameter: 4 ½ inches. Wavy (6 waves) vase with two (2) peacocks (males and female) seated on a branch with pink flowers and green leaves. Maker: Palissy. England. Royal Collection. Royal Worcester Company. Two peacocks — female and male with full open tail ; peacock = on a hill and are surrounded by flowers. Maker: Bavaria + flower within a triangle + letters "R" and "W."
0030. Palissy Bud Vase with Peacock decoration. Bud vase with two (2) peacocks (males and female) seated on a branch with pink flowers and green leaves. 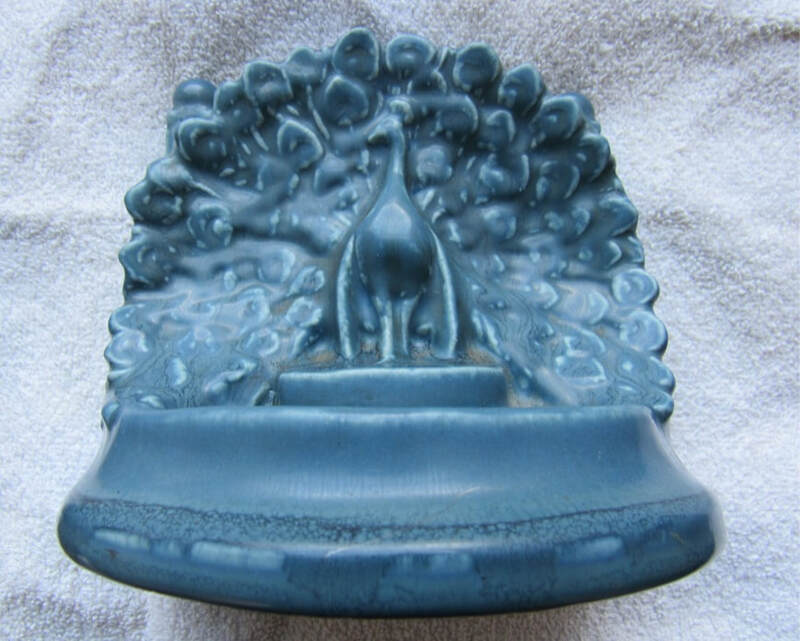 Spoon rest in the shape of a peacock with indented body to hold the spoon. The name "Israel" is in the depression where the spoon is rested. On this vintage brass ashtray a peacock is depicted in the ashtray bowl while a man, wearing a hat overlooks the peacock in bowl; note the rose blossom beside the peacock. 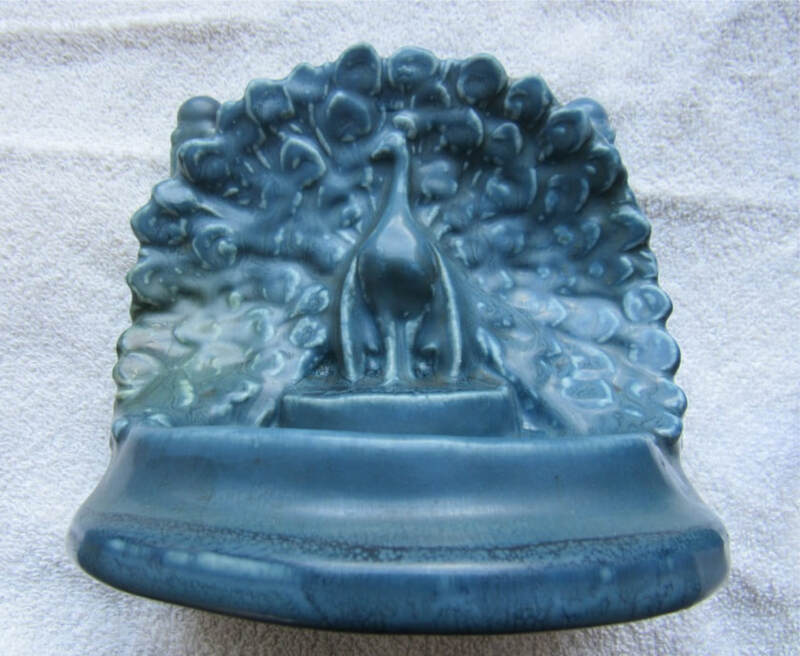 This vintage ashtray is probably from the 1920s-1930s. 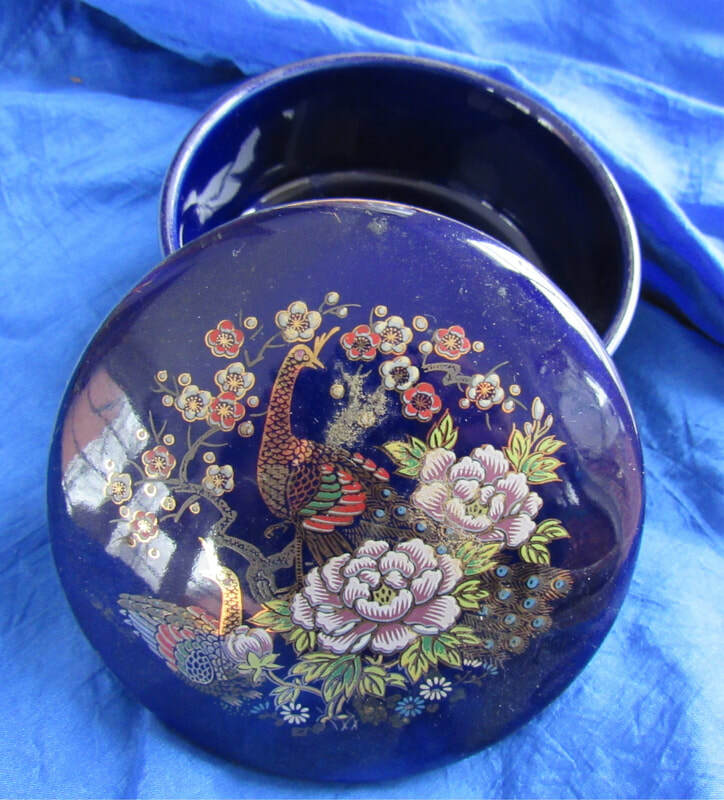 This square box (2 inches x 2 inches) has a stunning 3-deminsional peacock on the lid. Peacock's tail = fully displayed, each feather terminating with a sparkling glass bead. Interior = lined with black felt covering. Lid has magnet to hold in place. Mark: "Warsaw: in blue on bottom of base. This fan-shaped dish is perfect for holding jewelry (rings, necklaces, ear rings). Two peacocks (female and male) surrounded by multi-colored flowers; male peacock looks backward toward the female peacock. 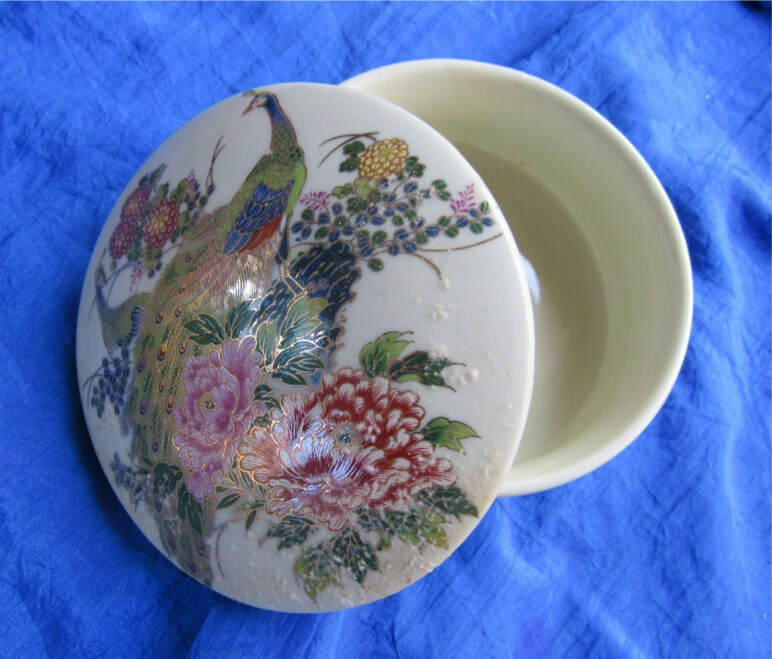 This trinket box is cream in color and decorated with colorful peacocks and flowers & leaves on the lid. Andrea by Sadek, also known as Charles Sadek Import Company or J. Willfred is headquartered in New Rochelle, New York. The company was founded in 1936 by Charles and Norman Sadek and is still owned and operated by the Sadek family. Currently, Charles' son, Jim, his wife, Sandra manage the day-to-day operations with a faithful staff of customer service reps, shippers, designers and product developers. The namesake of the company, Andrea, is Jim's sister and Charles Sadek's daughter; she is heavily involved in the design of Sadek's products. 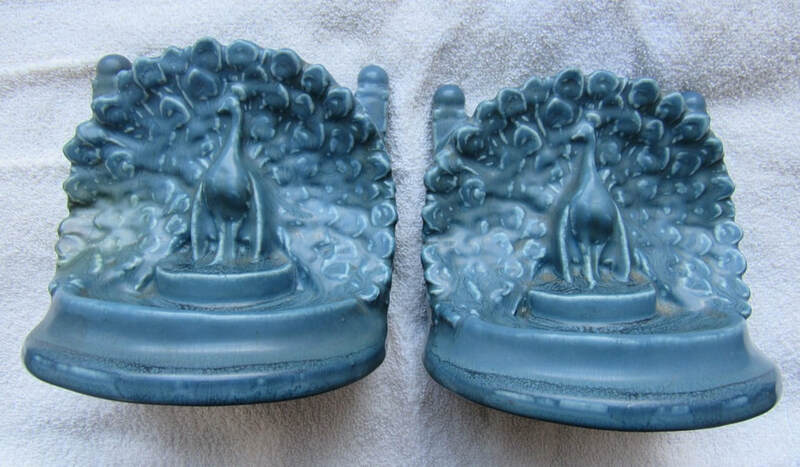 This Rookwood "Peacocks at the Fence" bookend set is in the very collectible and desirable turquoise glaze color. This particular design was made in 1920 — hence this set is 98 years of age. The bookends are weighted and together they weigh 5.01 lbs. (one = 2.13 lbs; the other = 2.15). Named after the Longworth family estate in Cincinnati, Rookwood became the first female manufacturing company in the United States. She hired a team of famous artists, talented art students and glaze technicians and encouraged them to exchange ideas. Most importantly, she encouraged her employees to be creative, to try new subjects, new techniques and new mediums. Whatever inspired them to create fine art. Source of above quote: Rookwood Pottery Company. History "Our Heritage"